Princesse Marina de Bourbon presented two editions for women this year – from the Royal Marina collection Royal Marina Turquoise and Royal Marina Intense, as well as fragrance for men Monsieur Le Prince Intense aimed at the man with strong character inspired by royal family.Composition of Monsieur Le Prince Intense opens with vibrant and fresh bergamot zests combined with fruity notes of apple and..
Princesse Marina de Bourbon presented two editions for women this year – from the Royal Marina collection Royal Marina Turquoise and Royal Marina Intense, as well as fragrance for men Monsieur Le Prince Intense aimed at the man with strong character inspired by royal family. Composition of Monsieur Le Prince Intense opens with vibrant and fresh bergamot zests combined with fruity notes of apple and pineapple. The heart develops aromatic notes of sage blended with jasmine and leather accords resting on musk, amber and blond wood. The fragrance arrives in a bottle of the same shape as men’s editions Le Prince Galant and Le Prince Charmant with a cap in silver color, with imprinted crowns. The central part of the glass flacon iridescent from light to dark blue features royal stamp, symbol of nobility, pride and power. Outer carton is in dark blue with a relief motive of brushed steel. 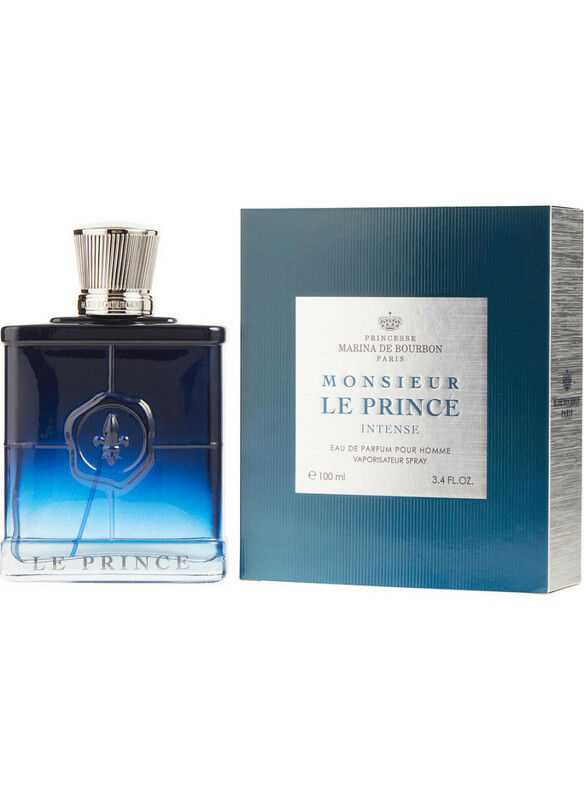 Monsieur Le Prince Intense is available in 50 and 100ml Eau de Parfum flacons. Monsieur Le Prince Intense was launched in 2015.